This post has been written by Ava, 7, who is at primary school and attended our ‘Schroders App Hack: Easter Edition‘ event on 5 & 6 April 2018. I was really excited when I learned I was going to build an app. I didn’t expect the amazing pastries when I arrived. It made me even more excited to be treated like royalty. I’ve never done any coding but it didn’t matter because there were lots of friendly helpers. My app didn’t win but that isn’t stopping me. I’ve been building another app using the Stemettes links and have started using scratch. I already knew I wanted to be a scientist and now I’m thinking about computer science. 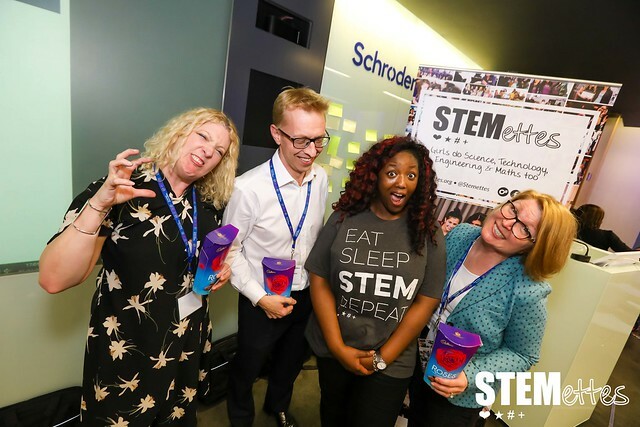 Thank you Stemettes and Schroders. We had 59 girls (& a few boys) coding with us over the 2 days. They gave it all 8.82 out of 10! 97% expressed improved STEM confidence. 95% had an improved perception of STEM. 92% had increased awareness of STEM options and 84% had an increased STEM network. 95% improved ability to carry out project work, 95% want to do coding in the future (8% hadn’t done any before, 33% had already done lots). 97% would like to come to a Stemettes event again. Thanks to Schroders for partnering with us on this event, and to Microsoft & FinTech Talents for sending representatives to join our judging panel.